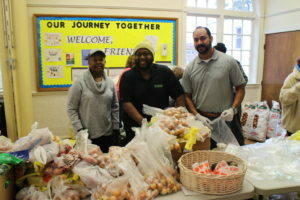 For residents driving up on Terrace Place on the morning of the November 19, a long line coming out of the St. James Episcopal Church parking lot indicated that despite the cold, people were determined to wait to have an opportunity to pick up food at the Daily Bread Food Pantry to celebrate Thanksgiving with their loved ones. As I walked inside of the room, there was the noise in unison of plastic bags being opened, filled, tied and piled, following categories, from boxes of stuffing, cans of cranberry sauce, and gravy to all sorts of fresh produce and fruits. 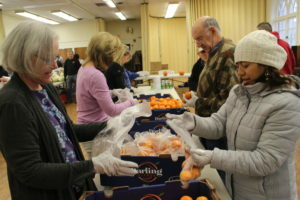 More than 50 volunteers, working hand-in-hand in perfect synchrony, didn’t stop until the last bag was filled and all the boxes of food were empty. To fulfill the traditions of a Thanksgiving feast, each household also received a turkey, along with all the fixings, like stuffing, cranberry sauce and gravy, and a choice of different kinds of pie. 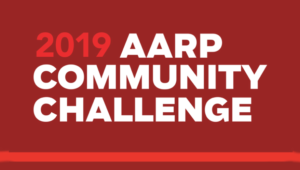 “We are really happy to be helping everybody; we have tons of volunteers from various schools, and civic organizations, businesses, banks, law firms and union lodges, from all over the place. Everyone is really pitching in, in picking up the food, helping with the storage. Just a million things have been behind the scene and it’s happening now. 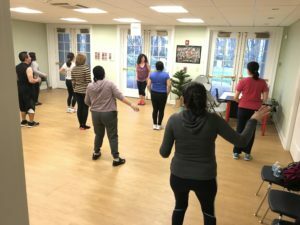 A lot of people have stepped forward to help,” said Landzberg. A group of youth stood out among the volunteers. Their vibe was contagious, and their pace was if they were getting ready for a 5K marathon. 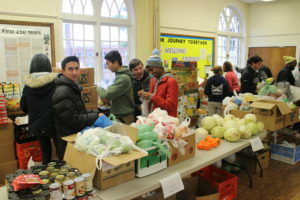 “Wooster School in Danbury has been involved in the food pantry program for several years. 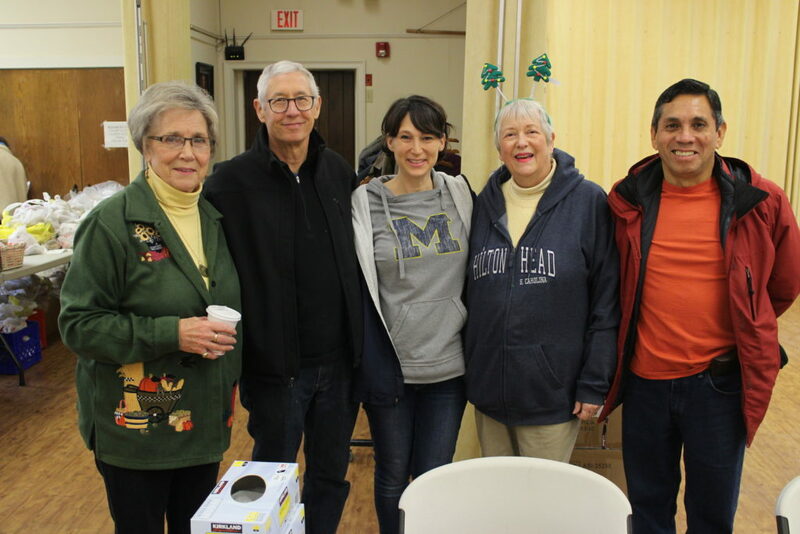 Several students, including some international students, volunteered at Daily Bread’s Thanksgiving Distribution,” explained Wooster School Center for Social Impact Director, Megan Rajnanshi. Daily Bread Food Pantry helps about 600 to 800 families every single month, and shelves, refrigerators and freezers are quickly depleted. 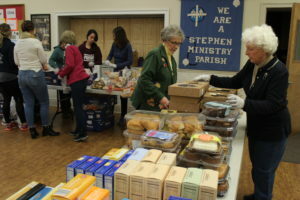 The Daily Bread Food Pantry is located at 25 West Street behind St. James Episcopal Church. Donations are welcome and just a click or a phone call away. 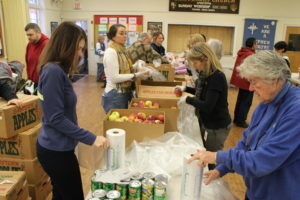 Just visit www.dailybreadfoodpantry.com or call 203-748-3561. You can also follow them on Facebook at dailybreadfoodpantry. From left: Danbury Wooster School students Matt Eskenazi, Christian Nast, Alan Jos, Drew Fortson, Ingrid Li and Michael Sun (kneeling) with the school’s Center for Social Impact Director, Megan Rajnanshi.